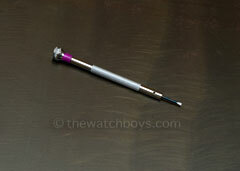 1.6mm Screwdriver [sd_1_6_single] - $12.99 : The Watch Boys, Providing quality products for watch collectors! Precision-made 1.6mm screwdriver: Designed with a slotted tip (like the OEM Panerai® version), to provide precision fit, and a smooth balanced handle to prevent slippage. Ideal for all screws with the corresponding head diameter, including both the Panerai® luminor® 40mm, 44mm and 47mm cases and buckles.